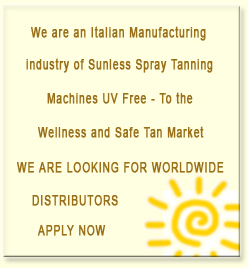 China spray tanning booth manufacturer supplier to the health care solarium salon business of the worldwide market, Asian sunless tan booth manufacturer for wellness beauty care distributors using biologic self tanner made in Italy. China spray tanning manufacturer Our automatic spray tan booth, 100% Made in Italy, designed to give same colour and skin care benefits as natural sun plus comfort and cheap price. SPRAY TAN TECHNOLOGY - BESTAN ITALY is an Italian new concept of high innovative automatic technology to the tanning industry, Bestan offers a patented revolutionary spray process to apply uniform amount of "Bestan biologic self tanner" to the entire body in just seconds combined with light therapy for VIP comfort and health tan treatment. THE BESTAN AUTOMATIC TANNING EXPERIENCE SYSTEM is the newest Italian generation of automated full-body tan treatment that allows you receive a combination of solutions that will bronze and smooth your skin. With preheat design utilized offers a perfect skin care treatment solution and comfort to fortify, moisturize and rejuvenate. You will feel totally pampered in the ultra comfortable sessions. SELF TANNER APPLICATION TECHNOLOGY Our engineering automatic spray system works with only 01 automatic nozzle designed to spray micro particles of our Italian biologic self tanner in a precise uniform amount to the whole skin of the customer, creating a smooth even natural looking tan..
LIGHT THERAPY TECHNOLOGY MADE IN ITALY new automatic and variable lighting process has been designed to improve and give you better performane of tanning treatment and love the look and health of your skin afterwards. SELF TANNER MATERIALS the components used in our self tanner solution are biological and have been successfully used in the beauty care cosmetic and food industry for decades, the components are proven safe to be used on the skin. The cosmetic applied covers uniformly on the skin is 100% natural and safe, it has been tested in scientific laboratories and doesn't presents risks to the skin health, our biological self tanner solution can be used with any type of skin, does not cause skin aging, rashes, burns and melanoma. 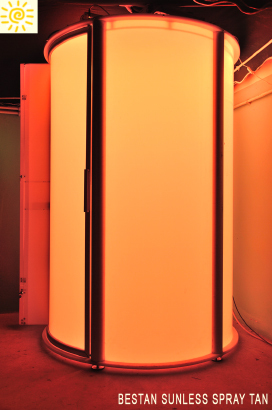 NON TOXIC MATERIALS the complete tanning booth is produced with the latest generation of non-toxic and hypoallergenic Italian certified materials. Our goal is to maximize your enjoyment and the best tanning experience. UV FREE TANNING Bestan offers the best tanning experience of the market 100% UV FREE. BESTAN SUNLESS SPRAY TANNING MACHINE MANUFACTURER as international tan manufacturing company we coordinate with each distributor, into the world market, the best strategy to cover their market supporting final customers: solarium business, wellness spa centre, VIP hotels, health care clinics, beauty care salon, industrial tanning cosmetics distributors. Bestan Italy offers the lastest spray tan technology from italy Europe, to develop a new solarium business with natural and biological self tanner cosmetic made in Italy to become tan leaders. BESTAN LIGHT THERAPY BesTan Italy offers a light therapy during your Tanning Session, using our polychromatic light emitting by colour diodes gives very bright full-spectrum light to your skin improving comfort and health. The light changes automatically during the treatment. Normally the light therapy is associated with the treatment of skin disorders, sleep and some psychiatric disorders. Light therapy directed at the skin is also used to treat acne vulgaris, eczema and neonatal jaundice. Light therapy which strikes the retina of the eyes is used to treat circadian rhythm disorders such as delayed sleep phase syndrome and can also be used to treat seasonal affective disorder, with some support for its use also with non-seasonal psychiatric disorders.